Here's the recipe for the vegan chocolate cake! Order now and get your heart in time for Valentines Day. 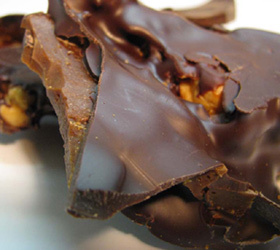 The Farm Sanctuary logo chocolate heart was created by Sjaak’s Organic Chocolates. Sponsor a Farm Sanctuary or Woodstock FAS animal and share your Valentine’s Day spirit with one of these sweet animals. 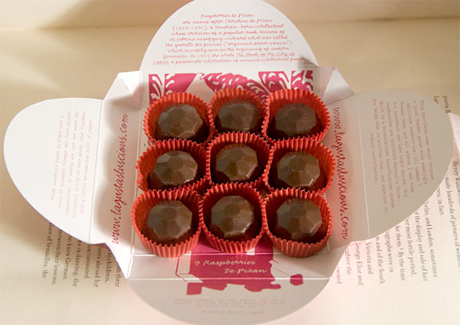 Bluestocking Bonbons are perfect for the sweethearts in your life--particularly the lovely women you're sweet on, since each one celebrates an inspirational woman. Sweet & Sara, who was recently featured on Food Network's 'Unwrapped' has some Vegan Marshmallow Hearts dipped in organic chocolate. Three-inch hearts, hand-cut and hand-dipped ... for that special someone. Get 20% off with the code FN20! Don't forget to set the mood with some naughty Vday candle scents! 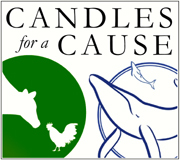 Or support a cause with the purchase of a candle. 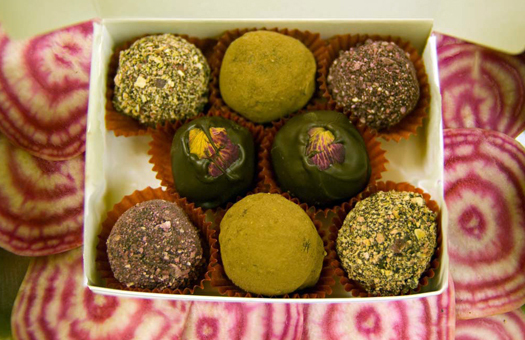 See the Valentines Gift Ideas pages over at Vegan Essentials, The Vegan Store, and Cosmo's Vegan Shoppe.